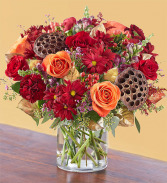 Let our brilliant bouquet full of breathtaking autumnal colors transport someone to their favorite faraway place. 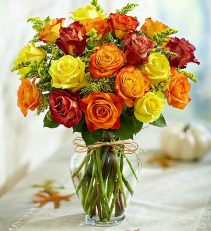 A rich gathering of blooms, hand-arranged inside a classic glass vase tied with raffia for a touch of Old World charm, makes a lovely and lasting statement. 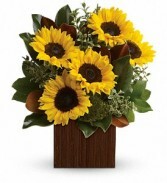 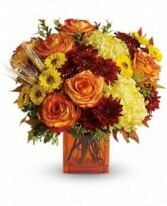 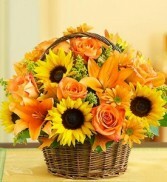 This lovely fall bouquet will instantly transport someone special to their favorite faraway place! A rich gathering of blooms is arranged inside a classic glass vase tied with raffia for a touch of Old World European charm. 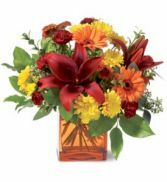 Arrangement includes orange roses, sunflowers, orange Asiatic lillies, red daisy poms,; accented with solidago, salal and stalks of wheat. 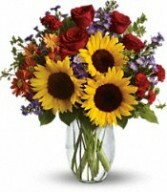 This festive arrangement is full of roses, sunflowers, and salidago to give a pop of color to any celebration! Sunflowers and Asiatic lilies, red roses, gold and burgundy chrysanthemums, solidaster, brown copper beech and salal are splendidly arranged in a wicker basket. 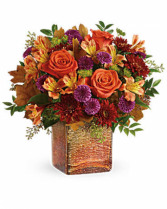 Hand-arranged in a shimmering opalescent mercury glass cube with gorgeous golden ombre finish, this vibrant autumnal arrangement is a beautifully breathtaking surprise! 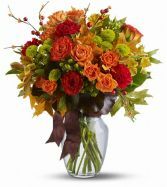 This radiant arrangement includes orange roses, light orange alstroemeria, purple button spray chrysanthemums, burgundy cushion spray chrysanthemums, bupleurum, seeded eucalyptus, huckleberry, and transparent autumn oak leaves. 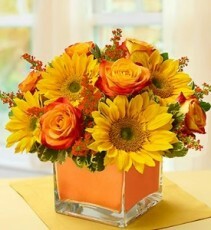 Delivered in a Golden Amber cube. This creation is filled with red & orange blooms, displayed inside a reusable bubble bowl vase. 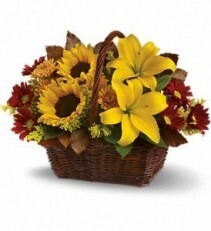 With warmth and charm, makes a great gift for sharing, or for a warm accent in your own home. 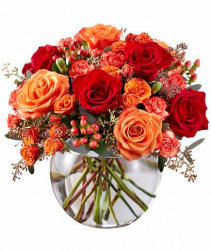 Gorgeous Autumn blooms with lotus pods in a clear glass cylinder vase. 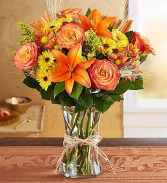 An orange glass cube vase holds autumn’s bounty: Asiatic lilies, miniature gerberas, cushion spray chrysanthemums, miniature carnations and seeded eucalyptus. 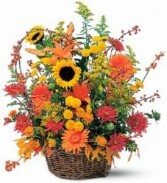 This arrangements comes in beautiful shades of red,yellow,green and orange. 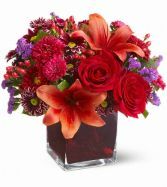 It includes chrysanthemums, carnations and alstroemeria. 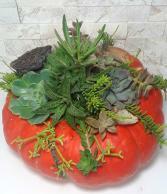 This beautiful fall arrangement is a great way to bring in the cool season. 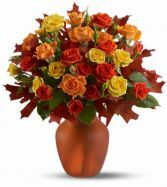 This orange glass vase is filled with orange Asiatic lilies, bi-color peach roses, orange roses, brick-colored roses, accented with salal, oregonia and autumn leaves. 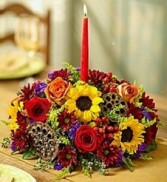 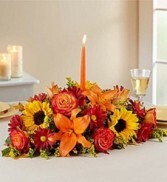 Set the holiday table in radiant style with this coloerful, autumn centerpiece! 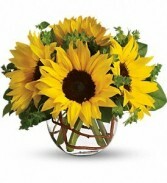 We use the freshest sunflowers, daisy poms and more; its topped with a festive candle to cast a rich and cozy glow upon your holiday celebrations with family and friends! This beautiful centerpiece is hand-designed with a gathering of fresh blooms in the most brilliant colors! 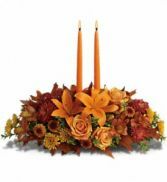 Designed with dried oak leaves for a rustic touch and a glowing candle. This classic arrangement will warm any home and heart - all throughout the season. 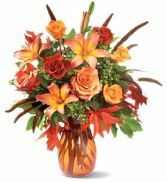 Arrangement includes orange roses, sunflowers, orange Asiatic lilies, mini carnations, red daisy poms; accented with solidago, sala and dried oak leaves.